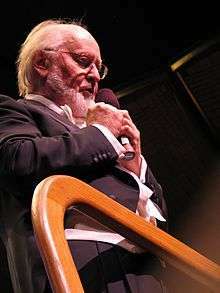 John Williams received the most nominations (25) and the most wins (4, alongside Dimitri Tiomkin). The Golden Globe Award for Best Original Score is one of several categories presented by the Hollywood Foreign Press Association (HFPA), an organization of journalists who cover the United States film industry, but are affiliated with publications outside North America, since its institution in 1947. Since the 5th Golden Globe Awards (1947), the award is presented annually, except from 1953 to 1958. The nominations from 1947 and 1948 are not available. The first Golden Globe Award for Best Original Score went to Max Steiner for his compositional work on Life with Father. John Williams is the artist with the most nominations (25); those resulted in 4 wins. Dimitri Tiomkin had the same number of wins, but out of only 5 nominations. Other notable achievers include Maurice Jarre (10 nominations, 4 wins) and Alan Menken (5 nominations, 3 wins). Artists like Jerry Goldsmith (9 nominations) and Michel Legrand (7 nominations) were nominated several times, but never received the award. Dmitri Tiomkin, Alan Menken and Howard Shore are the only composers to win two consecutive awards. Additionally, Dimitri Tiomkin received Special Achievement Awards for his services to film music in 1955 and 1957, as did Hugo Friedhofer in 1958. The most recent recipient of this award was Ennio Morricone for the film The Hateful Eight, his third Golden Globe. "†" indicates an Academy Award-winning score. "§" indicates a Golden Globe Award-winning score that was not nominated for an Academy Award. 1.^ The year indicates the period for which the awards are given and not the year the ceremony took place in. ↑ "HFPS Golden Globes Page". Hollywood Foreign Press Association. Retrieved 2007-06-26. ↑ "The 5th Annual Golden Globe Awards (1948)". Hollywood Foreign Press Association. Retrieved 2007-06-26. Nominations for 1947 are not available. ↑ "The 6th Annual Golden Globe Awards (1949)". Hollywood Foreign Press Association. Retrieved 2007-06-26. Nominations for 1948 are not available. ↑ "The 4th Annual Golden Globe Awards (1947)". Hollywood Foreign Press Association. Archived from the original on November 24, 2010. Retrieved 2011-06-14. ↑ "The 5th Annual Golden Globe Awards (1948)". Hollywood Foreign Press Association. Archived from the original on November 24, 2010. Retrieved 2011-06-14. 1 2 "The 6th Annual Golden Globe Awards (1949)". Hollywood Foreign Press Association. Archived from the original on November 24, 2010. Retrieved 2011-06-14. 1 2 3 "The 7th Annual Golden Globe Awards (1950)". Hollywood Foreign Press Association. Archived from the original on November 24, 2010. Retrieved 2011-06-14. 1 2 3 "The 8th Annual Golden Globe Awards (1951)". Hollywood Foreign Press Association. Archived from the original on November 24, 2010. Retrieved 2011-06-14. 1 2 3 "The 9th Annual Golden Globe Awards (1952)". Hollywood Foreign Press Association. Archived from the original on November 24, 2010. Retrieved 2011-06-14. 1 2 "HFPS Golden Globes Page". Hollywood Foreign Press Association. Retrieved 2007-06-26. The Original Score Award was not given from 1953 to 1958, according to the individual yearly award pages. ↑ "The 17th Annual Golden Globe Awards (1960)". Hollywood Foreign Press Association. Archived from the original on November 24, 2010. Retrieved 2011-06-14. 1 2 3 4 5 "The 18th Annual Golden Globe Awards (1961)". Hollywood Foreign Press Association. Archived from the original on November 24, 2010. Retrieved 2011-06-14. 1 2 3 4 5 "The 19th Annual Golden Globe Awards (1962)". Hollywood Foreign Press Association. Archived from the original on March 8, 2012. Retrieved 2011-06-14. 1 2 3 4 5 "The 20th Annual Golden Globe Awards (1963)". Hollywood Foreign Press Association. Archived from the original on November 24, 2010. Retrieved 2011-06-14. 1 2 3 4 5 "The 22nd Annual Golden Globe Awards (1964)". Hollywood Foreign Press Association. Archived from the original on November 24, 2010. Retrieved 2011-06-14. 1 2 3 4 5 "The 23rd Annual Golden Globe Awards (1965)". Hollywood Foreign Press Association. Archived from the original on November 24, 2010. Retrieved 2011-06-14. 1 2 3 4 5 "The 24th Annual Golden Globe Awards (1966)". Hollywood Foreign Press Association. Archived from the original on November 24, 2010. Retrieved 2011-06-14. 1 2 3 4 5 "The 25th Annual Golden Globe Awards (1967)". Hollywood Foreign Press Association. Archived from the original on November 24, 2010. Retrieved 2011-06-14. ↑ "1968 Golden Globes". Los Angeles Times Envelope Awards Site. Archived from the original on 2007-05-18. Retrieved 2007-06-29. The score for Oliver! by Lional Bart was on the ballot, but was declared ineligible and removed. 1 2 3 4 5 6 "The 26th Annual Golden Globe Awards (1968)". Hollywood Foreign Press Association. Archived from the original on November 24, 2010. Retrieved 2011-06-14. 1 2 3 4 5 "The 27th Annual Golden Globe Awards (1969)". Hollywood Foreign Press Association. Archived from the original on November 24, 2010. Retrieved 2011-06-14. 1 2 3 4 5 "The 28th Annual Golden Globe Awards (1970)". Hollywood Foreign Press Association. Archived from the original on November 24, 2010. Retrieved 2011-06-14. 1 2 3 4 5 "The 29th Annual Golden Globe Awards (1971)". Hollywood Foreign Press Association. Archived from the original on November 24, 2010. Retrieved 2011-06-14. 1 2 3 4 5 "The 30th Annual Golden Globe Awards (1972)". Hollywood Foreign Press Association. Archived from the original on November 24, 2010. Retrieved 2011-06-14. 1 2 3 4 5 6 "The 31st Annual Golden Globe Awards (1973)". Hollywood Foreign Press Association. Archived from the original on November 24, 2010. Retrieved 2011-06-14. 1 2 3 4 5 "The 32nd Annual Golden Globe Awards (1974)". Hollywood Foreign Press Association. Archived from the original on April 30, 2008. Retrieved 2011-06-14. 1 2 3 4 5 "The 33rd Annual Golden Globe Awards (1975)". Hollywood Foreign Press Association. Archived from the original on November 24, 2010. Retrieved 2011-06-14. 1 2 3 4 5 "The 34th Annual Golden Globe Awards (1976)". Hollywood Foreign Press Association. Archived from the original on November 24, 2010. Retrieved 2011-06-14. 1 2 3 4 5 "The 35th Annual Golden Globe Awards (1977)". Hollywood Foreign Press Association. Archived from the original on November 24, 2010. Retrieved 2011-06-14. 1 2 3 4 5 "The 36th Annual Golden Globe Awards (1978)". Hollywood Foreign Press Association. Archived from the original on November 24, 2010. Retrieved 2011-06-14. 1 2 3 4 5 6 7 "The 37th Annual Golden Globe Awards (1979)". Hollywood Foreign Press Association. Archived from the original on November 24, 2010. Retrieved 2011-06-14. 1 2 3 4 5 6 "The 38th Annual Golden Globe Awards (1980)". Hollywood Foreign Press Association. Archived from the original on November 24, 2010. Retrieved 2011-06-14. 1 2 3 4 5 "The 40th Annual Golden Globe Awards (1982)". Hollywood Foreign Press Association. Archived from the original on November 24, 2010. Retrieved 2011-06-14. 1 2 3 4 5 "The 41st Annual Golden Globe Awards (1983)". Hollywood Foreign Press Association. Archived from the original on November 24, 2010. Retrieved 2011-06-14. 1 2 3 4 5 "The 42nd Annual Golden Globe Awards (1984)". Hollywood Foreign Press Association. Archived from the original on November 24, 2010. Retrieved 2011-06-14. 1 2 3 4 5 "The 43rd Annual Golden Globe Awards (1985)". Hollywood Foreign Press Association. Archived from the original on November 24, 2010. Retrieved 2011-06-14. 1 2 3 4 5 "The 44th Annual Golden Globe Awards (1986)". Hollywood Foreign Press Association. Archived from the original on November 24, 2010. Retrieved 2011-06-14. 1 2 3 4 5 "The 45th Annual Golden Globe Awards (1987)". Hollywood Foreign Press Association. Archived from the original on November 24, 2010. Retrieved 2011-06-14. 1 2 3 4 5 "The 46th Annual Golden Globe Awards (1988)". Hollywood Foreign Press Association. Archived from the original on November 24, 2010. Retrieved 2011-06-14. 1 2 3 4 5 "The 47th Annual Golden Globe Awards (1989)". Hollywood Foreign Press Association. Archived from the original on November 24, 2010. Retrieved 2011-06-14. 1 2 3 4 5 "The 48th Annual Golden Globe Awards (1990)". Hollywood Foreign Press Association. Archived from the original on May 27, 2011. Retrieved 2011-06-14. 1 2 3 4 5 6 "The 49th Annual Golden Globe Awards (1991)". Hollywood Foreign Press Association. Archived from the original on October 7, 2010. Retrieved 2011-06-14. 1 2 3 4 5 "The 50th Annual Golden Globe Awards (1992)". Hollywood Foreign Press Association. Archived from the original on October 7, 2010. Retrieved 2011-06-14. 1 2 3 4 5 "The 51st Annual Golden Globe Awards (1993)". Hollywood Foreign Press Association. Archived from the original on July 5, 2011. Retrieved 2011-06-14. 1 2 3 4 5 "The 52nd Annual Golden Globe Awards (1994)". Hollywood Foreign Press Association. Archived from the original on October 7, 2010. Retrieved 2011-06-14. 1 2 3 4 5 "The 53rd Annual Golden Globe Awards (1995)". Hollywood Foreign Press Association. Archived from the original on December 29, 2010. Retrieved 2011-06-14. 1 2 3 4 5 "The 54th Annual Golden Globe Awards (1996)". Hollywood Foreign Press Association. Archived from the original on December 29, 2010. Retrieved 2011-06-14. 1 2 3 4 5 "The 55th Annual Golden Globe Awards (1997)". Hollywood Foreign Press Association. Archived from the original on October 7, 2010. Retrieved 2011-06-14. 1 2 3 4 5 "The 56th Annual Golden Globe Awards (1998)". Hollywood Foreign Press Association. Archived from the original on December 29, 2010. Retrieved 2011-06-14. 1 2 3 4 5 6 7 8 9 "The 57th Annual Golden Globe Awards (1999)". Hollywood Foreign Press Association. Archived from the original on December 29, 2010. Retrieved 2011-06-14. 1 2 3 4 5 6 "The 58th Annual Golden Globe Awards (2000)". Hollywood Foreign Press Association. Archived from the original on December 29, 2010. Retrieved 2011-06-14. 1 2 3 4 5 6 7 8 "The 59th Annual Golden Globe Awards (2001)". Hollywood Foreign Press Association. Archived from the original on December 29, 2010. Retrieved 2011-06-14. 1 2 3 4 5 "The 60th Annual Golden Globe Awards (2002)". Hollywood Foreign Press Association. Archived from the original on May 9, 2011. Retrieved 2011-06-14. 1 2 3 4 5 "The 61st Annual Golden Globe Awards (2003)". Hollywood Foreign Press Association. Archived from the original on December 29, 2010. Retrieved 2011-06-14. 1 2 3 4 5 "The 62nd Annual Golden Globe Awards (2004)". Hollywood Foreign Press Association. Archived from the original on December 29, 2010. Retrieved 2011-06-14. 1 2 3 4 5 "The 63rd Annual Golden Globe Awards (2005)". Hollywood Foreign Press Association. Archived from the original on December 29, 2010. Retrieved 2011-06-14. 1 2 3 4 5 "The 64th Annual Golden Globe Awards (2006)". Hollywood Foreign Press Association. Archived from the original on December 29, 2010. Retrieved 2011-06-14. 1 2 3 4 5 "The 65th Annual Golden Globe Awards (2007)". Hollywood Foreign Press Association. Archived from the original on March 18, 2011. Retrieved 2011-06-14. 1 2 3 4 5 "The 66th Annual Golden Globe Awards (2008)". Hollywood Foreign Press Association. Archived from the original on December 29, 2010. Retrieved 2011-06-14. 1 2 3 4 5 "The 67th Annual Golden Globe Awards (2009)". Hollywood Foreign Press Association. Archived from the original on December 29, 2010. Retrieved 2011-06-14. 1 2 3 4 5 "The 68th Annual Golden Globe Awards (2010)". Hollywood Foreign Press Association. Archived from the original on December 29, 2010. Retrieved 2011-06-14. 1 2 3 4 5 "The 69th Annual Golden Globe Awards (2011)". Hollywood Foreign Press Association. Archived from the original on October 4, 2013. Retrieved 2011-12-15. 1 2 3 4 5 "Nominations 2013 — Golden Globe Awards". goldenglobes.org. December 13, 2012. Retrieved December 13, 2012. 1 2 3 4 5 "Nominations 2014 — Golden Globe Awards". goldenglobes.org. December 12, 2013. Retrieved December 12, 2013. 1 2 3 4 5 "Nominations 2015 — Golden Globe Awards". goldenglobes.org. December 11, 2014. Retrieved December 11, 2014. 1 2 3 4 5 "Winners & Nominees 2016". Retrieved June 5, 2016.